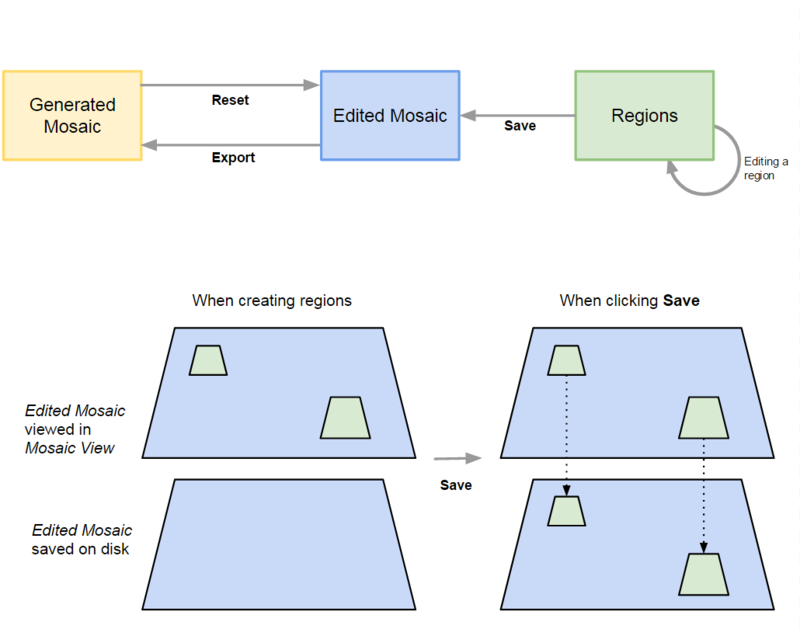 Important: For more information about the Mosaic Editor: Menu View > Mosaic Editor. The Orthomosaic generated in step 3. DSM, Orthomosaic and Index (Generated Mosaic) is copied in order to be edited (Edited Mosaic). The DSM generated in step 3. DSM, Orthomosaic and Index is loaded and can be visualized. The DTM generated in step 3. DSM, Orthomosaic and Index is loaded and can be visualized. The Edited Mosaic is loaded in the Mosaic View and can be edited. The region is displayed in the Mosaic View and can be edited by using the Mosaic Editing right sidebar. The Mosaic Editing sidebar allows to edit the Mosaics for the selected Region. Editing the area: By clicking in the vertices of the region and dragging the mouse to a new position. a. Select an image in Planar Projection. b. Select one or multiple images in Ortho Projection. If multiple images are selected, they will be blended together. The Mosaic View displays the Edited Mosaic saved on disk and on top is overlaying the regions created and their selected projection. Saves the changes of the selected Edited Mosaic to a temporary disk (Overwrites only the areas corresponding to the existing regions using the selected projections). The saved Edited Mosaic will be used when exporting and when opening the Mosaic Editor again. The Edited Mosaic in disk is overwritten by changing the content of the regions with the new projection selected. Reset the Edited Mosaic with the Generated Mosaic (which is stored in the results folder). The Edited Mosaic overwrites the Generated Mosaic that is stored in the results folder. Ensure that all changes to be exported are saved. Exporting the edited mosaic will overwrite the mosaic that was generated at step 3. DSM, Orthomosaic and Index. The last saved Edited Mosaic is loaded in the Mosaic View. If any region was drawn, it is loaded and displayed together with the selected projection in the Mosaic View as Region layer.